Photo by The Dawson The Dawson's enormous patio feels like the backyard most Chicagoans long for. It's secluded, lively, welcoming and comes complete with an outdoor bar, ample landscaping, a pergola, as well as communal and lounge seating. Dubbed the gathering place of Chicago's West Town neighborhood, The Dawson serves American fare in a casual setting perfect for after work drinks, weekend brunch and everything in between. Photo by Michael Muraz, CC BY-NC-ND 2.0 Located on the 18th floor of the Northwestern Memorial Hospital office complex in Chicago's Streeterville neighborhood, GreenRiver is home to one of the city's biggest and best outdoor terraces. The Michelin-starred restaurant is known for its inventive food and bar menu, which serves seasonal American fare and cocktails inspired by Chicago's Irish-American heritage. When the weather is warm and the 80-seat terrace is open, you'll be sipping drinks like the the Hinky Dink, Gray Wolf and Comiskey Park against a backdrop of Lake Michigan and the surrounding downtown area. The terrace opened April 1 and offers seating on a first-come, first-served basis. Photo by Chicago Athletic Association Hotel The Chicago Athletic Association Hotel is housed in a fully-restored Venetian Gothic building originally built more than 100 years ago. While it’s hard to pick its best feature, the rooftop bar just might be it. Cindy's offers stunning panoramic views of Millennium Park and Lake Michigan, which make the perfect backdrop to the yacht-club-meets-beach-house vibe of the place. The powerhouse behind the menu at Cindy's is Executive Chef Christian Ragano and Spirit Guide Nandini Khaund. It’s open for weekend brunch, lunch and dinner and reservations are available for parties of four or more. Photo by Clayton Hauck Paying homage to the city’s West Side fish and chicken joints, Parson's Chicken & Fish in Chicago’s Logan Square neighborhood is about as unpretentious as you can get with a menu as impressive as the one offered. The place is inviting, inspiring and often an immensely good time. Paron's is also home to a stellar patio that falls somewhere between backyard and beer garden, complete with picnic tables and bonfire pit. Executive Chef Hunter Moore has put together a menu spanning brunch to bar food and features must-try items like trout crudo, loaded hash browns, fried Amish chicken, cheese curd fritters, hush puppies and more. To wash it all down, Bar Manager Charlie Schott offers beer, booze and frozen cocktails, including the popular "Original Negroni Slushy" and a respectable rotation of craft beer drafts from folks like Half Acre, Lagunitas, Solemn Oath and 3 Floyds, to name a few. Photo by Eric Kleinberg The swanky yet cozy J. Parker is no stranger to local lists of best bars and for good reason. Perched atop the boutique Hotel Lincoln in Chicago's Lincoln Park neighborhood, it's home to two bars, a 55-seat enclosed portion reminiscent of a glass greenhouse, as well as a 140-seat open-air area. From its 13th-floor location you'll enjoy expansive views of Lincoln Park Zoo and Lake Michigan. A menu of small plates from soon-to-open The Kennison will be served this summer. The drink menu features craft beer, wine and destination-inspired cocktails like the Vino de Sol, which was inspired by the beverage director's love of Spain. Photo by Cassandra Stadnicki Wicker Park’s Big Star is a local favorite year-round, but this taqueria's patio makes it a summer staple. Just off the Damen stop on the CTA Blue Line, this "bourbon and beer-focused, taco-slinging, late-night honky-tonk" is housed in a 1940s gas station that serves up a Mexican street food-inspired menu from Executive Chef Paul Kahan and Chef de Cuisine Julie Warpinski. As the weather warms, Big Star's garage doors roll up and its yellow patio chairs are out for open-air and outdoor seating. Spots are offered on a first-come, first-served basis, but always worth the wait. Photo by Raised Raised is an indoor/outdoor rooftop bar on the third floor of the Renaissance Chicago Hotel that features an ambiance and aesthetic the blends well with the surrounding city. Located at 1 W. Walker Dr., the lounge is industrial, eclectic and relaxed, but its most impressive feature may be the views of downtown and the Chicago River. According to the Raised website, the views helped inspire the bar’s name, which "refers to many conceptual layers: the iconic bascule drawbridges that line the Chicago river, the river locks that raise the water for passing boats, and the elevation of the urban rooftop location." A snack menu created by Executive Chef Daniel Perez is offered and includes truffle frites and fried oysters, while the drink menu curated by William Nykaza is robust enough not to disappoint and features a rotation of draft beer and bottles from local breweries. Photo by Phil Solomonson City Winery Chicago Riverwalk is a top-notch culinary destination and music venue with the menu and musical guests to prove it. On top of that, the Chicago outpost of this multi-city winery is located along the bustling Chicago Riverwalk and comes complete with ample outdoor seating. "We are trying to pair the culinary experience with a cultural experience," says City Winery's website. "We are attempting to create the perfect setting to share with friends your passion for wine, music and great food." With winter behind us, it’s officially outdoor dining and drinking season. The arrival of spring is an occurrence worth celebrating in Chicago, a city as famous for its culinary scene as it’s infamous for its brutal winters. This week’s Bucket List brings you a round up of our favorite bar and restaurant roof decks, patios and terraces across the city. 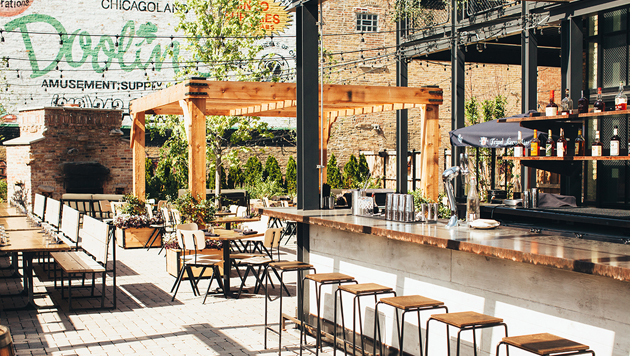 You’ve got all summer to check out these open-air establishments, which include a Chicago Riverwalk winery, curbside tacos in Wicker Park and drinks with a view atop some of Chicago’s best hotels.